Frozen shoulder, also called adhesive capsulitis, occurs when tissues around the joint, scar and stiffen, restricting movement or making it painful and stiff. This condition occurs due to overuse, injury or because of diseases like diabetes or stroke. Frozen shoulder treatment includes both surgical and non-surgical procedures. 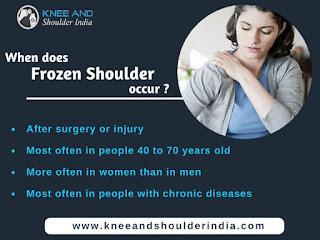 Frozen shoulders can develop after surgeries as well, due to limited movement of shoulder. Found commonly in middle aged people, it is more prominently seen in women than in men. Women are susceptible to this disorder around the menopausal period. Freezing stage – the range of shoulder motion becomes limited and increased movement causes pain. Frozen stage – though pain decreases, the stiffness of shoulder increases. Thawing stage – the pain and stiffness starts easing. The diagnosis for frozen treatment can be done through a physical examination and X-ray. During physical examination, the doctor can detect limitations in the range of motion of shoulder. X-ray can help in confirming that the issues are due to frozen shoulder and not arthritis or any such disorders. Medication: The medications for frozen shoulder includes corticosteroid injections to reduce pain and stiffness in the shoulder joints. It helps with improving mobility of the shoulders at the initial stages of the disease. Joint distension: This method of frozen shoulder treatment involves injecting the shoulder joint capsule with sterile water. This helps in loosening of tissues and thereby, ease movement. Shoulder manipulation: Performed under general anaesthesia to reduce pain due to movement, this treatment involves moving the stiff joints continuously to ease stiffness and tightened tissue. Surgery: This is an extreme measure performed in cases when other treatments do not work. Surgery is performed to remove the adhesions or scar tissues from shoulder joint. This surgery is usually performed as arthroscopy. Knee and Shoulder India is an orthopaedic treatment centre dealing with knee and shoulder disorders. They provide advanced remedial treatment to improve movement and fitness.